Chicken Masala Roast with tender chicken pieces slow cooked and coated with a spicy roasted coconut-based gravy is extremely droolicious! The tantalizing rich aroma and enticing flavours makes this Chicken Masala Roast exceptionally delightful. 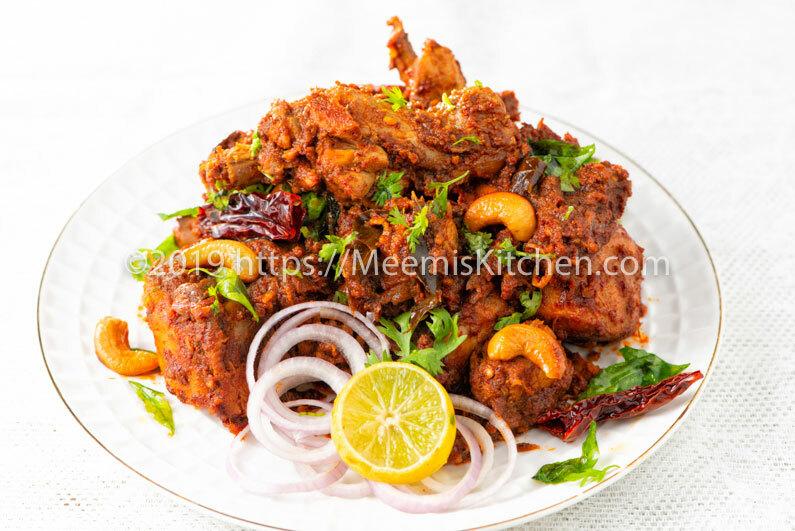 Here is one more unique chicken recipe to add to your favourite recipe collection- My special Chicken Masala Roast. This recipe for Chicken Masala Roast is a fusion of south Indian / North Indian cuisine. You will love the splendid amalgamation of flavours, which you can experience in just one dish. I am always on the lookout for new flavours and keen to experiment with different ingredients to make my menu exciting. Recently, I have taken a fancy to exploring Indian cuisine and am trying to recreate dishes that exploit the best of different regions in India. Loved the way this “Chicken Masala Roast” turned out,(perfected in just two times) so, wanted to share this original recipe with my readers. Hope you will love it too! 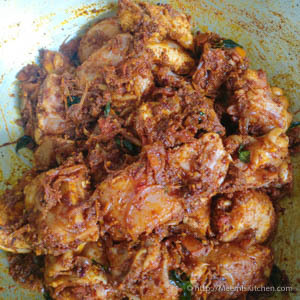 This chicken Masala Roast has thick spicy Masala gravy as compared to my Easy Chicken Roast and Thirummi chicken roast. It is a dry gravy dish, with less gravy or thick gravy that coats the chicken pieces, like Peshawari chicken curry, Kadai chicken and Chettinad chicken curry. If you are looking for more gravy, check Punjabi Chicken Curry, Spicy Ginger chicken, Nadan Chicken curry with Potatoes, Chicken curry with Thengakoth, Butter chicken etc. In this recipe, chicken is slow cooked until the spicy gravy coats the pieces. Roasted Coconut and spices enhance the taste and flavours of the dish and take it to another level. You can serve chicken Masala roast with rice, Pulao or Rotis. Like Kerala Egg roast, this goes well with Vellayappam, Kallappam, Appam, Neer dosa and Idiyappam as well. Here is the special Chicken Masala Roast recipe that is extremely delicious, with mouthwatering flavours! Enjoy! Dried Kashmiri chilli (whole) : 10 nos. Dried Kashmiri chilli : 2 nos . Clean the Chicken pieces, drain and keep aside. 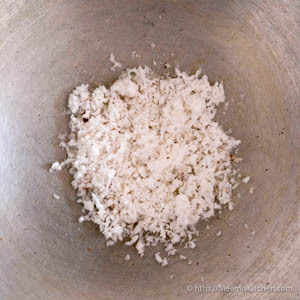 In a big pan, Heat 1 tsp Coconut oil and fry the grated coconut. 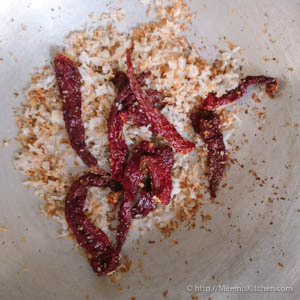 When the colour starts changing, add dried Kashmiri chilies and stir fry till slightly brown. 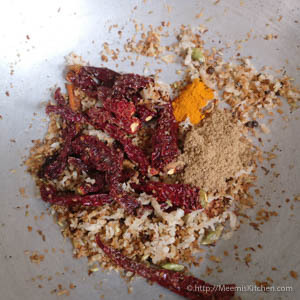 Next add whole Pepper, cardamom, cinnamon, Cloves, Jeera (cumin and Perumjeera (Fennel seeds) and fry till the coconut turns medium brown and releases nice aroma. Turn off the heat at this point and add coriander powder, Garam Masala and turmeric powder. Stir well and allow to cool. 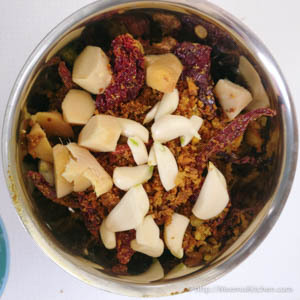 Grind this roasted Masala with ginger and garlic to a slightly coarse powder (Do not add water or make a fine paste). 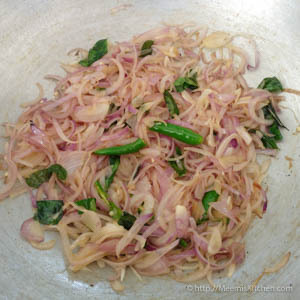 In the same pan, heat the rest of coconut oil and add thinly sliced onions, slit green chili and curry leaves. 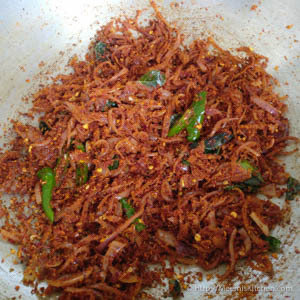 Fry till limp and add the ground masala. 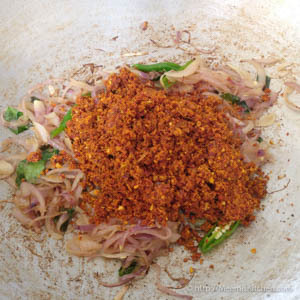 Mix well and continue to stir fry for few minutes. 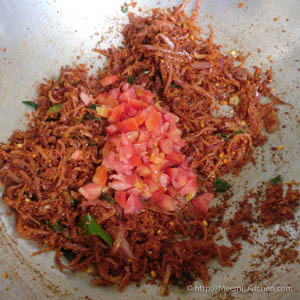 Next, add chopped tomatoes and fry till it is mashed. 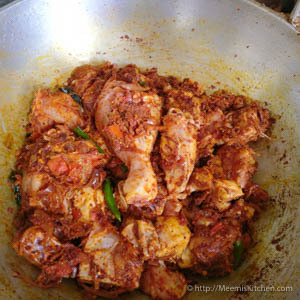 Add the chicken pieces, salt and vinegar and combine well with the masala gravy. Cover and keep on medium flame for 5 minutes and stir again. 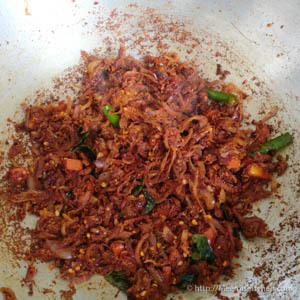 Water will start to release after a few minutes, slow cook on small – medium flame, stirring in between to avoid sticking. If there is very less water to cook chicken, then add a quarter cup water. Once the chicken is cooked, with well coated gravy switch off the flame and allow to rest. In another pan, heat ghee and roast Cashew nuts, Red chilli and curry leaves. Garnish the chicken with this and chopped Coriander leaves. Enjoy with Rice, Pulao, Rotis, Appam or Idiyappam. 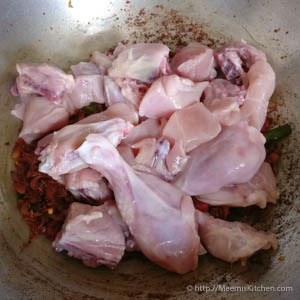 Use fresh tender chicken with bones for best results, it gives more depth and flavor to the curry. Please adjust the spices according to your spice level. Add chilies as per your liking. 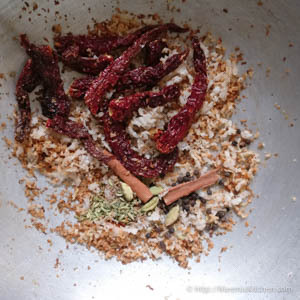 Roasted coconut and whole spices release great flavor and aroma and transforms the whole dish. Add little water if you need more gravy, ideally you should have a thick gravy that coats the chicken pieces. Slow cook the chicken on slow- medium flame, stirring occasionally to avoid sticking in order to absorb the flavors. Use Coconut oil for best results. 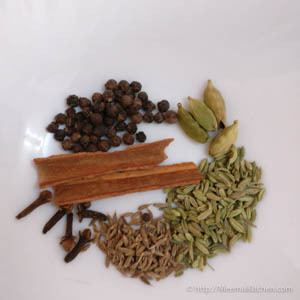 Please check the link for Homemade Garam Masala. I would love to hear from you about this exotic Chicken Masala Roast with thick coated gravy. Please leave your comments below if you like this recipe and please share with your friends using the buttons on the side. You can also subscribe to my newsletter to get recipe updates on regular basis. God Bless! !